This book should definitely not be read without having read the first two books, Huntress Moon and Blood Moon. As it is, this review may contain some spoilers, although I tried to keep out any major plot points or twists that may occur. 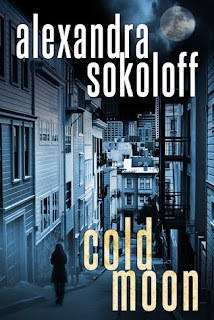 Author Alexandra Sokoloff continues to keep the tension high in Cold Moon, the third book in her series, even despite FBI Special Agent Roarke and his team having caught their killer. If only it were that simple. Roarke continues to struggle with his feelings for the Huntress and what the implications of that may be for his job. Law enforcement has always been his passion and yet he doubts its effectiveness--his effectiveness--at trying to root out the evil in society. To complicate matters, he is also dealing with issues of Post Traumatic Stress, something that anyone in his shoes would likely be given everything that has transpired over the course of the series. With the Huntress in jail awaiting trial, another killer appears to be picking up her mantel. Roarke and his team are not sure what they are dealing with. A serial killer? A vigilante? They know they have a job to do though, and they do what they can to try to get to the bottom of it. There's a lot of discussion about intuition and feelings that can seem to border on the paranormal, but does not go there. At time it felt like it could, but Sokoloff keeps the story grounded in reality. She does a good job of letting us see into Cara's mind and know what her thought process is. In my review of Blood Moon, I commented how I wanted a little more character development of the minor characters; I get it in Cold Moon. I really like the character of Singh, one of the FBI team members working with Roarke, in the novels and was glad to see her featured a bit more in this installment of the series. And I'm back to liking Special Agent Epps. Whew. I really do understand his frustration though. Both he and Roarke have similar goals, but it's not as clear cut for Roarke, given his ambiguous feelings toward the Huntress. There is quite a lot going on in Cold Moon. The case against the Huntress is weak at best, the only witness to the crime they can pin on her has gone missing, and then the new murders . . . Add to that Roarke's mental state, a social worker hellbent on protecting her girls, a distraught sister, the speed and influence of social media, and the growing discontent of the public. What you get is a novel that takes you on an intense ride that you just have to see until the finish--and what a finish it is. The only fault I found with the book was that, with so much going on, it felt sometimes as if I was reading two books instead of just one. There were also moments when my suspension of disbelief was put to the test, but fortunately I never left the story. As often happens with series' books there are things I still have questions about, characters left hanging--which likely will be answered in future books. I hope. So, I am always more forgiving in that regard. Overall, I have enjoyed this series, as dark as it is. It was impossible not to be pulled into the novel and cheer for the Huntress, even in her lawlessness. I want the evil to be stamped out as much as she does. If only it were that simple. Kay - If you do give the series a try, I hope you like it, Kay! :) I read the first two, but wasn't involved enough to want to continue. I'm glad to see it doesn't wander into paranormal. I might have to give this series a try. Kathy - I don't mind paranormal in my books, but I prefer this one to stick to reality. As good as this series sounds I'm sad to say my not starting a series unless its received from an author/publisher rule still stands. I will however make a note of it for future reference as it does sound like something I'd probably enjoy. Tracy - I understand. If you do get around to reading it, I hope you like it! Melody - I hope you like the series if you do give it a try, Melody!